I can't help but share with you this cool link where you can find pictures of famous landmarks with the lights off and on. 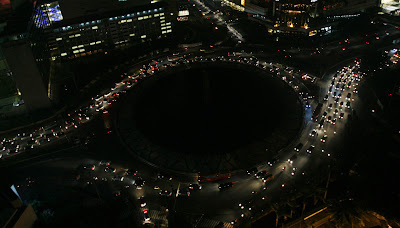 Just click the picture to see how the light dimmed for one hour to celebrate Earth Hour 2009, like this dark Bundaran HI in Jakarta. A small step but it was a step after all. We joined this green awareness by switching off our most of lamps in the house. I said most, because I couldn't help not watching the first episode of "Project Runaway" Season 5. Sorry, Mother Earth.